Miles Gordon was selected by the Cincinnati Reds in the 4th round of the 2015 Major League Baseball draft. The organization sent the then 17-year-old to Goodyear to play for the Arizona League Reds. He debuted on July 15th, going 1-5 with an RBI. The next day was a big one, going 3-5 with a double and he drove in three runs. That first week would see him go 6-23 (.261) with a walk and four strikeouts. The second week, and final one of July, things slowed down for Gordon. The outfielder went 6-26 (.231) with two doubles, a walk and 10 strikeouts. For the month he hit .245/.275/.306 with two walks and 14 strikeouts. When August began things started out well for Gordon, going 3-9 with two triples and a walk in the first two games. The rest of the week was a struggle though, going 1-8, but he did walk twice. 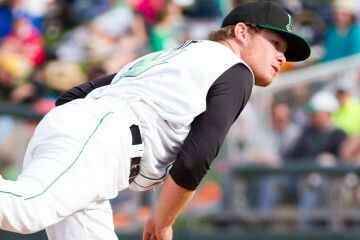 The slump continued into the next week as he went just 1-16 with a walk and two strikeouts. Over the final ten games of the season the teenager from Ontario went 9-36 (.250) with a double, triple and a walk. August was a struggle as he would hit .203/.253/.304 in 19 games with five walks and 12 strikeouts. 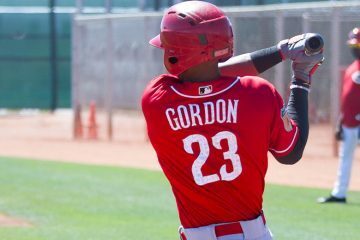 Hitting | Gordon projects to have an average hit tool, but one that could play up slightly because of his speed. He can already use the entire field. Power | He didn’t show much power in his debut, granted he was just 17. He doesn’t project for too much power in the future, though double digit home run totals aren’t out of the question. He should develop good doubles power. Throwing | His arm rates out as average. Defense | He should be able to remain in center field where he can use his speed well, but he probably won’t be an above-average defender. The debut for Miles Gordon wasn’t a strong one. He struggled at the plate, hitting just .220 on the season. Of course, it was just 31 games worth of hitting and he was just 17-years-old. At this point of his career, the numbers don’t mean too much. When you watch him play you can see the tools in action. His bat is quick and stays level through the zone, which should allow him to hit much better in the future. The key for Gordon will be to develop his bat as he continues to move up the ladder and to remain in center field where his bat will play best. He doesn’t profile to have a bat that will play in the corners. He’s likely to repeat the Arizona League as an 18-year-old, but with a good extended spring could push himself up to Billings.